A hands-on cooking class culminating in a family-style dinner served with wine and beer. Little impresses like a well-executed risotto. Unfortunately, many are terrified to tackle it. Let Viola assuage your fears and teach you her five foolproof steps to a memorable dish. 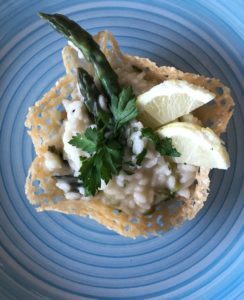 In this hands-on class, you will explore the different varieties of rice suitable for risotto, the importance of good stock, and how to prepare versions both classic and contemporary. Class will end in risotto dinner rounded by a seasonal salad and a good glass of wine! Viola Buitoni, a direct descendant of the famed pasta and chocolate family, hails from Perugia, in the heart of Umbria. She came to the US for college, but soon after attending NYU as an economics major, she was drawn back into her genetic passion for food. She ran an Italian catering business and had a shop showcasing the best of Italian food on Madison Avenue in NYC. After moving to San Francisco in 2004 to start a family, Viola can now be found giving lectures on Italian food traditions and trends, and teaching cooking classes in collaboration with 18 Reasons, SF’s Italian Cultural Institute and Italian Consulate, Cavallo Point Lodge Cooking School, Draeger’s in San Mateo and Blackhawk and Pepperberries in Eugene, OR. Since 2013, she has been a brand ambassador for Baci, the iconic Italian chocolates made by Perugina, the worldwide confectionery brand founded by her great grandfather. Viola has also produced food articles and cooking videos for MissionLocal.org. Recently, she began speaking on panels about tradition and innovation in food production and leading groups to explore local and artisanal food systems and producers in Italy. You can follow her adventures and find information on traveling with her at www.violabuitoni.com.